The day I first heard about the Little Lost Note was the beginning of an exciting adventure. I met Frog CEO, Ben, for a 10 minute chat at the gates of Brighton station, en-route to rural southern Sweden to begin a 6 week artist residency for the Summer. Ben had seen my screen printed characters and thought that this style could bring his interactive narrative to life. By the time I reached Tranås an email was waiting for me with a draft script – and so once I’d settled in I began to imagine what the Little Lost Note might look like. My studio was on the top floor of a converted fur factory, and I slept there too. The early sunrises were incredible. The Note was deep blue, to begin with, and by accident wore a slightly furious facial expression. She looked like a stern librarian had wandered into the make-up department of Avatar. I was experimenting with the texture of dry gouache paint and brush pen. I continued the roughs by combining hand-drawn techniques with digital manipulations. It was then that I settled on a yellow /gold colour – this felt most instinctive for her character. I sent off a variety of notes to Ben, and he chose number 6. That is the Note we eventually cast in the story. The Note began life in a scene of tall pine trees, a misty dawn and a bush with a pair of eyes peering out. It was a bit like the Moomins meets the teddy bear’s picnic meets Sleepy Hollow. Her surroundings were definitely influenced by mine, at the time, as I navigated my way around a new place. I spent a lot of time outdoors – early each morning I swam in a deep lake in the forest, and on the first weekend there was a music festival in the park. The park joined onto a forest footpath on one side, with the river, a skate park and ornamental gardens on the other. As the drafts developed, the trees grew blossom and bright leaves, and the colour palette of the book as a whole tuned into the season of Spring. It became softer and easier on the eye for the target audience. The Little Lost Note is a kind of early years road-novel – it’s just as much about her journey towards self-discovery as it is about what happens at the end. I felt an affinity with her as I was on a journey too. The Note is curious, determined and playful, characteristics which I enjoyed visualising for our young viewers to identify with. The world she travels through is visually rich, and the interactive creatures, clouds, plants and trees make it all the more believable and immediate. I began serious work on the illustrations when I returned to the UK in September. Much of the work was done in the evenings and lunchtimes as I was working full time at that point. I’d create line drawings and scan them, completing each image in Photoshop to enable flexibility and the achievement of the clean, 2D colours within the hand drawn, loose style. As a piano player myself I was most drawn to the creation of a piano – simplifying the real instrument to become a wise and kindly character was really fun. I think that the piano is the oldest of all the instruments but it still has a twinkle in its eyes. 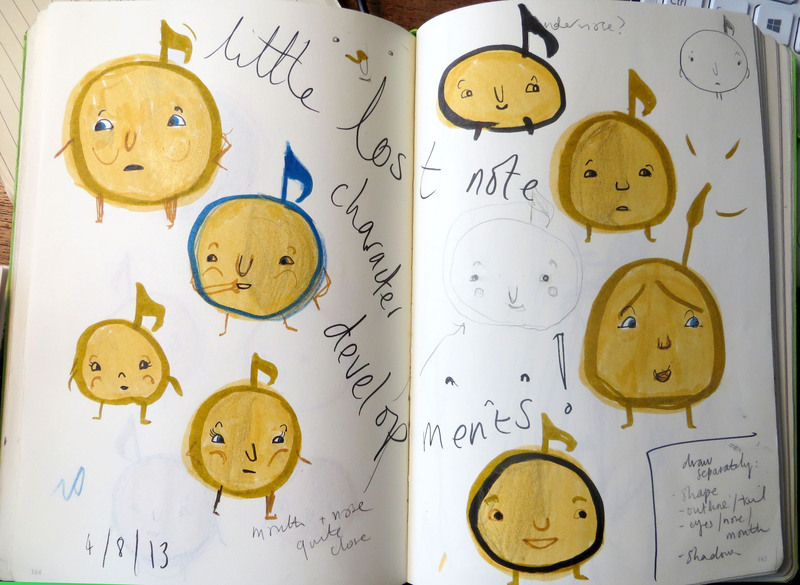 Creating the illustrations for the Little Lost Note was like doing a big puzzle – there were many different elements for each page and although some pages show a similar scene, there were always tweaks to be done, such as checking the progression of the sun, the sky colours and consistency of line. I also had to take into account the interactions – making the note’s limbs, tail and shadow moveable for Cath, our animator, to perform her magic. Minutes turn into hours very easily with any creative project, and the Little Lost Note and I saw the clock strike midnight more times than I can count on my fingers! The most challenging scene for me to draw was definitely the bandstand end pages. I drank a lot of tea – I was visiting my parents that weekend and so my mum kept popping in to see how I was doing. She has a keen critical eye and this comes in handy when I’m doing more complicated drawings. She had a joke going that maybe Box of Frogs would like the bandstand so much that they’d ask me to illustrate a whole book called ‘The Little Lost Bandstand’. The bandstand does look pretty cool with all the instruments on it – but I wouldn’t fancy drawing lots of them! It is based on the one in Chepstow where my cousin and I played when we were young. Helen now has a lovely little boy, and when she was showing him the app at Christmas, she immediately recognised our bandstand at the end. To see the app come together and launch has been a fantastic experience. As an illustrator I’ve learnt new ways of working with a narrative text to bring it alive. The narration, the soundtrack, programming and animation complete the jigsaw and this app has many different ingredients which complement each other and make the Note’s journey one to look at over and over again. It was a pleasure to work alongside so many talented people on bringing this narrative to life, and I look forward to the next adventure in the Little Lost series. Click here to buy The Little Lost Note for iPad and iPhone!